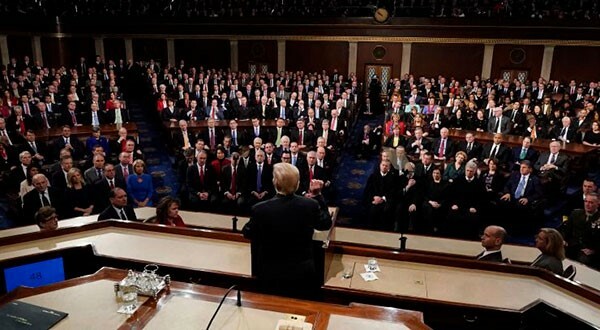 Machinists Union International President Robert Martinez Jr. is attending the State of the Union address as a guest of U.S. Rep. Donald Norcross (NJ-01) to sound the alarm on securing back pay for federal contract workers after the longest government shutdown in U.S. history. Norcross recently introduced the bipartisan Fairness for Federal Contractors Act (H.R. 824) to retroactively pay up to $1,400 per week to the more than 1 million federal contractors who were impacted by the 35-day long shutdown. The IAM highly supports this legislation. Approximately 5,000 out of the nearly 35,000 federal contractors represented by the Machinists Union lost wages or paid leave because of the recent government shutdown, including IAM members who work as contractors at NASA, the FAA, HUD, the U.S. Air Force and more. TAKE ACTION: Call our hotline at 1-888-894-1028 to be connected to your member of Congress. Ask them to co-sponsor the Fairness for Federal Contractors Act of 2019 (H.R. 824). Read IAM International President Martinez’s letter to members of Congress urging them to support the Fairness for Federal Contractors Act.